You can find our latest entries on Progress Chic here. Back in 2007, we coined a new term for a design style that we saw emerging, 'Progress Chic'. Progress Chic crosses many design industries, from fashion and food to interior design and autos, and it is quite unique from other design styles in that it encompasses the best of contemporary science, design, and culture within its parameters. It does this by building on the learning and advances of our past while at the same time inspiring an even more exciting future that respects both people and planet. Progress Chic is not geek chic, tech-fashion, or any other future-inspired design because, along with cutting-edge science and innovative design, it honors, respects, and remains open to the moving aspects of culture and our past that bring so much meaning to our lives. The images above are great examples of this Progress Chic trend. 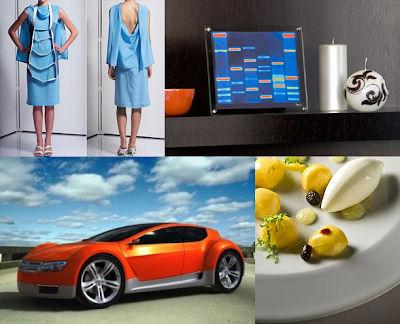 Learn more about each by visiting their respective websites...starting from the top left and going clockwise: SANS, DNA 11, molecular gastronomy Chef Wylie Dufresne's wd~50, and the Dodge Zeo.